A Tonk's Tail... err, Tale...: Neko Flies and Chewy: WIN-WIN! 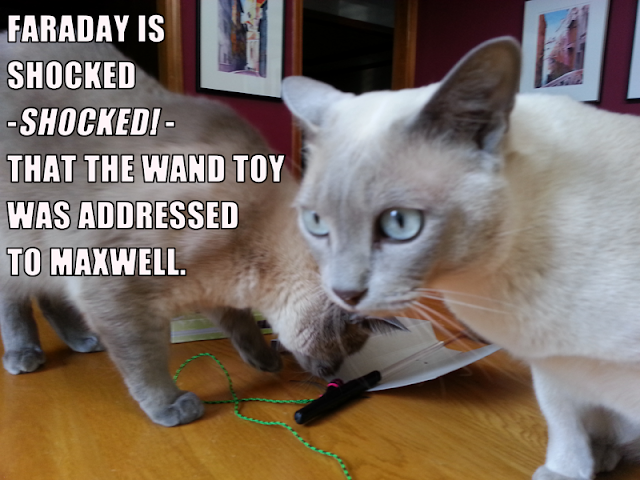 Recently, the nice man from Chewy.com heard that Maxwell was a Neko fanatic, and so he asked if Max would like to review one of the Neko Flies wand toys that Chewy.com now carries. Then the special package arrives. Of course, what's a good story without a bit of conflict...? Until Faraday noticed that Maxie had ordered the Katarantula Spider Cat Toy. Which is PINK. And then, of course, there was Allie. Who figured anything PINK was her lawful territory. Maxwell, being the nice kitty that he is, let ladies go first. Needless to say, she gave the Neko Flies ten pink toenails UP, waaaay UP, as you can see from her photo essay to the right. She felt that pink would stand out quite nicely against the green grass. The boys knew better than to argue the point. Especially since they have firsthand experience with the swiftness of those pink paws, as evidenced in the center photo. Once his Katarantula had been liberated from Her Highness and was once again in his possession, it became obvious that this particular Neko Flies toy would be as big a hit in our home as the Kittenator. Or the Kittycada. We thank Chewy.com profusely for giving us this toy for review. To say Neko is the favorite brand in our home is not overstating. Is there a Neko Flies Anonymouse Chapter in the Midwest? Anyone? Many thanks to Chewy.com for the Neko Flies toy. By the way, we order our food & litter from them periodically, and shipping from Chewy.com is a breeze. There's free shipping on every order $49 and above, and anything less is a reasonable $4.95. Chewy.com graciously gave Neko Flies to us to review, but all opinions are strictly our own. That was one epic battle. We were on the edge of our seats. Ha ha. Brill production. Have a super Sunday. Harley agree, the Neko Fly is one of his favorite toys of all time! We have never seen a Neko Fly but it looks like lots of fun. Oh! We are so glad you've discovered one of our favorites. We are Neko Fly addicts here, too! Haha what a funny picture of Faraday! Glad you kitties are having a fun weekend. I think the Katarantula Neko Fly is my favorite! I only have the Kragonfly and Kittenator so I can't speak for the others. I'll take my peacock feathers over both of them. We LOVE Neko flies. Glad Allie has a PINK one, how cool is that! We have asked Santa for a Neko fly!!! Wooohoooooooo!!!! We wanna know why our terrible Mommy hasn't gotten us one of THOSE. Maxwell, you RULE. Glogirly snuck one of the Neko's into the townhouse the other day. Something about walking to the neighborhood store called "Bone Adventure" to ask them to vote. Guess she felt inclined to "buy" her vote. No, it's still in the box. Drat! She better not return it if we lose. Wowwie! What action! What suspense! What a cool toy! Me has had one on my Christmas list for 2 YEARS!!!! Oh what fun!! :) got to love being toy testers. We love our Neko Fly!! It's awesome!! And we love Chewy too!! That is a perfect toy!! Pawsome prezzie, Max! Lord it over Faraday long as you can. Lording is fun!